Newly sworn in Gov. Larry Hogan released about half the state budget Thursday, the $16.4 billion general fund budget — spending funded by sales, income, and corporate taxes and gambling. The budget reduces $766 million in planned spending increases, with health care providers, state employees and aid to education taking the biggest hits. State workers will get no cost-of-living or merit raises, saving $156 million, but none will be laid off. Provider reimbursement for health and disabilities will go back to 2014 levels, saving $160 million. All state agencies will be cut by 2 percent across the board, saving $118 million, similar to action O’Malley took Jan. 7. Details were fairly sketchy, including the amount of total state spending, which comes to about $39 billion this year. The five budget books with over 3,000 pages of spending details won’t be available until Friday. Printing of the books had been delayed to adjust the numbers based on Gov. Martin O’Malley’s cuts in the current year budget. The most detail was found in a 17-page document released after Hogan’s comments. Transfer tax money designated for Program Open Space will be spent on open space and the flush tax will go directly to the Chesapeake Bay Restoration Fund. In past years, money from those special funds were used to balance the general fund budget. However, $50 million borrowed by former Gov. Bob Ehrlich from Program Open Space will not be repaid, as currently required by law. The new budget includes some unspecified tax cuts, which Hogan said he will announce later. He said his budget reduces the state debt in the long run, but is concerned about the pension liabilities. The general fund budget does not include many state operations paid for with special funds and federal dollars. Items not included are transportation, roads, transit, toll facilities, most of university spending, and federal dollars which pick up over half of Medicaid. Hogan will leave funding for the Purple Line in the D.C. suburbs and the Red Line in Baltimore in the transportation budget until his administration can evaluate it further. Hogan emphasized the record spending on school aid, which goes up by just $36 million, but it was planned to go up $143 million. 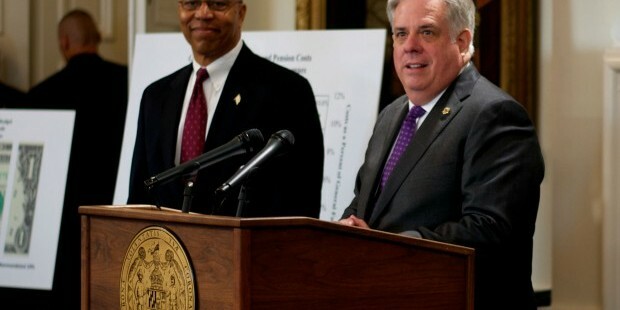 Hogan is cutting the geographic cost of education index in half. 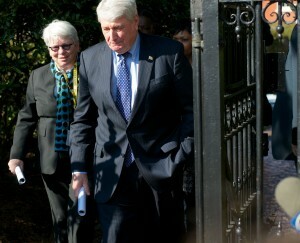 House Speaker Michael Busch and Appropriations Chair Maggie McIntosh leaved budget briefing at Government House. “Every county in this state takes a cut in their education aid,” Del. Maggie McIntosh, the new chair of the House Appropriations Committee, told reporters. She was critical of that cut, and the failure to fund negotiated pay increases for state workers, who had endured furloughs, flat salaries and increased costs for health and pension benefits in recent years. McIntosh and House Speaker Michael Busch were both critical of some of Hogan’s cuts, but they admitted they had seen few details in an hour briefing from Hogan. “This briefing did not have the detail we’re accustomed to getting,” McIntosh said. McIntosh said her committee would take the next 80 days of the legislative session to work on improving Hogan’s budget. McIntosh downplayed Hogan’s claim that he had cured the structural deficits in coming years. “Every governor puts forth a balanced budget,” she said. “Every year is a record year” for education spending. “I’m confident that the economy will lift us out of this,” she said.